If you’re writer in India who is on a journey to getting your first book published, congratulations to you! 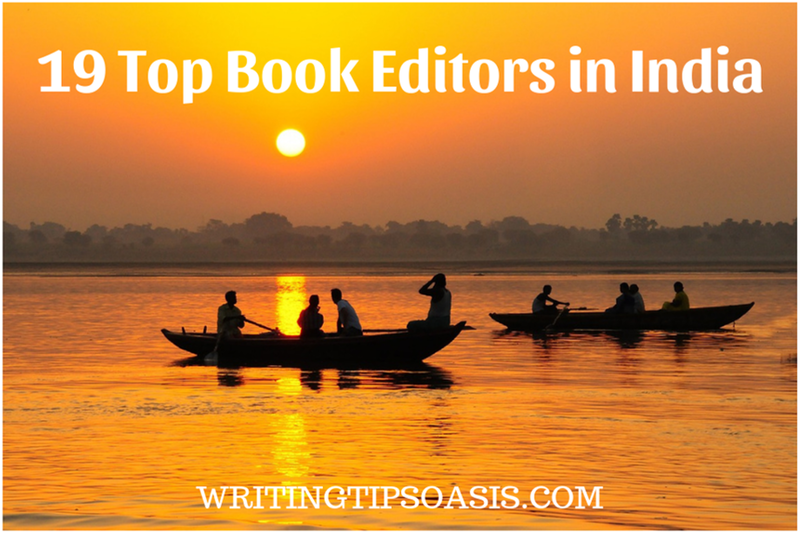 To you maximise the chances of getting a good response when your submit your manuscript to a publishing house, ensure it has gone through a round of developmental editing and copy editing carried out by a professional editor such as one of the following 19 top book editors in India. Note: When choosing a book editor including any of the following, be sure to engage in a dialogue with the individual or company, check our references and reviews, request sample edits and get a proper quote so you’re confident you know what type of service you’ll be getting. Your editor needs to be a critic, best friend, mentor and guide. That’s why a team of experienced professionals at Happy Self Publishing are an ideal pick. With their industry knowledge and years of experience they can help you write, edit, review, design and market your book. If you are a new author or first time novelist, their affordable editing packages can help give your book the boost it needs. A good editor can hone your material without changing the tone and that’s what you can find here. Write an email to them to inquire prices and details about editorial services. A writer herself, Dagny understands the intricacies involved in writing and researching a book. Her writing years gave her the push and skills needed to become an editor. She offers different types of editing through her blog Serenely Rapt depending on your need and proficiency. Amateur writers and authors may need more hand-holding than experienced authors. There is beta editing, copy editing, developmental editing and complete editing. All these editing types are different levels of editorial services from just your basic evaluation to a complete content revision, rewriting or expansion. You can send the first 3 chapters of your book or 1000 words and she will do a sample edit for your perusal. Contact her via email for queries and questions. A science fiction book can’t be edited by somebody experienced in romance or non-fiction. Different genres require different manners of editing, revising and content review. Become Shakespeare has a team of editors experienced in different genres you can choose from. Their sharp eye and keen sense of language offers you and your book the edge it needs to succeed in the market. Basic and extensive editing styles or varied editing style guides such as Chicago and Oxford are available for the writer to choose from. To learn more about their prices and availability send a sample chapter and synopsis via email. One of India’s biggest content creation agencies, LexiConn has been around since 2009. A full service team of writers, editors and designers work hard to achieve the goal of providing you a well-written, crisply edited book. Based in Mumbai, they have worked with several authors, companies and institutions for their content and editorial needs. For fiction and non-fiction writers, a professional experienced editor can offer insights that will aid you in becoming a better writer. Select between technical edit, hard edit and copy edit once you know where your project stands. You can send a sample of up to 5 pages and they will do a free edit for you. Write to them via email for prices and packages of editorial services. Writer, designer and poet Harika Bantupalli wears many hats. Among them is the hat of an editor and life coach. Located in Vishakhapatnam, she works with authors and writers based across India, offering them her editing skills and talent. She has previously worked with authors of fiction, non-fiction, short stories, poetry and magazines. Working on diverse mediums and genres has given her the knack of understanding what sells. In a country like India, it is crucial to get your colloquialism and language perfect. Harika’s background as a writer and editor puts her in the premium position of ensuring your book speaks to your target audience in India. You can also ask her to proofread and index your book. Write to her using the online contact form so she can discuss your needs and requirements. A former chief editor of a publishing house, Puspanjalee is now a freelance book editor. A blogger, writer, entrepreneur and life coach, Puspanjalee wants to empower other writers and bloggers. Her blog details the technical and real aspects involved in making a career as a writer. As a writer or amateur author, she will give you real honest feedback and knowledge that will boost your writing and book. She has worked on 80 books in the non-fiction and academic genre with companies and authors across the world. Puspanjalee doesn’t restrict herself to any genre and has expertise in writing and working on various styles of content. You can use the online contact form to request more details. India’s premier literary agency and consultancy also offers other services such as editing and manuscript review. Located in Delhi, they count iconic Indians such as Dipa Karmakar, Hussain Zaidi and Vishwanathan Anand among its authors and clients. They can predict what the Indian audiences are looking for which is essential for a writer to understand before selling a book. 400 authors have worked with them to edit and proof read their books. As a first time writer, you need concise, brutal feedback which family or friends may not be able to provide. This is where Writer’s Side steps in and lets you see the whole picture. With constructive criticism, you can take the steps required to change and improve your book. They don’t edit works of authors they represent. Contact the Delhi based agency via email for your project. Author, writer, marketer and editor Rasana does it all. An Amazon bestselling author, she has worked in self-publishing for years and deems it the future. Living in Mumbai, she is a voracious reader and as such feels she can connect with writers better. Her keen interests lie in editing fiction of all genres except horror. She is also a ghostwriter for anybody who needs assistance in polishing their manuscript. Her editorial skills are sharp and she can trim manuscripts when needed. Contact her via email for further details and information. Based in Mumbai, Tara Khandelwal has been an editor for the past 7 years. Her impeccable resume involves stints at prestigious companies like Bloomberg Quint, Penguin India and HarperCollins. While her niche lies in fiction and business books, she is available to edit all kinds of books. You can ask for a manuscript review, a generic structural edit, line edit, copy edit or proposal edit. A proposal edit is perfect if you have a rough idea but don’t know how to start or pitch. As an editor she knows her foremost duty is to support the writer in their endeavor. You can contact her using the online contact form to learn more about her services and prices. Blogging, book reviewing, writing and editing are just some things Inderpreet Uppal excels at. Whether it’s a fresh perspective or an outsider’s opinion, she is capable of editing your book masterfully. Inderpreet will have a look at your material and assess the level of editing involved. Sometimes a writer just needs minor improvements or one round of edits to complete their book. Or proofreading services to pick minor spelling or grammatical mistakes and manage flow of content. Contact her via email to discuss your project and professional requirements. This Princeton graduate is a popular children’s books author in India. Shivani is a mom, housemaker, author, writer and editor who has studied in pedigreed institutions in the US and India. Her degrees and her stints as a editor, translator and writer gave her the tools needed to become a freelance editor of fiction books. Her interests in reading and literature fuel her passion and she uses it to create a perfectly edited and proofread book. Contact her using the online form to inquire about her services and your project needs. An editor will not just point out your mistake but also add to your style of writing. A paragraph you think is beautifully written can actually feel tedious for your reader as its stretching the story without any purpose or relevance. As a writer herself, Shruthi knows how difficult it can be to accept loopholes or mistakes in your first novel. She uses her experience and empathy to urge authors to not focus on the method but the result. Working with Shruthi as an editor guarantees you a book that is smartly written, compact and intriguing without being lengthy or monotonous. Located in Fremont and Bengaluru, Shruthi can offer copy and line editing services to authors of fiction, non-fiction and short stories. Write to her via email to know about her services and get a free sample edit. Approaching book editing with a 4 point process that involves painstaking research and critique of the work, Varsha is a hard working editor. She doesn’t take the job of assessing someone else’s work lightly and believes your editor should be the one in love with your book. If your editor doesn’t appreciate your writing or genre, they are not likely to work to present it in a readable manner. That’s why Varsha always selects projects and books she genuinely likes and believes in. With this kind of emphasis on quality over quantity you can be assured of premium editing and proofreading at your side. Contact her via email to request more details. Sameer Kamat started Booksoarus to support other writers, bloggers and amateurs wanting to get published or turn to writing as a career. His website has a plethora of information on blogging, editing, publishing, writing, marketing and making money as a writer. Genuine support, resources, tips and links are available for any young writer out there struggling to get better or become professional. Booksoarus also provides services such as editing, mentoring and critique for writers in need. Highly selective of the kind of projects they choose, the team has worked extensively in publishing before. They have 2 different kind of editing packages available for you to choose from. You need to know what level of editing and support you require and choose between the 2 packages accordingly. Write to them via email for further details and information. This former journalist turned editor and writer has won several awards for her writing and content. While she continues to churn quality content for herself, she also is eager to help other writers and authors finish their book. Samarpita is the assistant, friend, mentor and coach of your dreams as she will treat your book as her own and edit it with a sharp eye. A well-edited book is the only promotion strategy you will need. You can have the right content but readers may get bored if you use too much prose or be too literal. Samarpita will comment on your style, grammar, length, tone and flow to transform your book into a novel. Her services include manuscript review, proofreading, basic editing, advanced editing and final stage suggestions. Write to her via email for quotes or rates for services offered. The Hyderabad based writer and editor has been recognized by noteworthy institutions and committees across India for her writing and books. Her blog consists of her writings, book reviews, tips and resources for writers. As a passionate reader, Vrinda can tell you the difference between a well edited book and a lack luster one. Her knowledge of writing and books propels her editorial skills and she encourages her authors to be honest with her. Is this sentence necessary? Can you end on a question, a suggestion or a thrilling note instead of something generic? Vrinda will indulge in open, long discussions and debates about your book, characters and your story before she makes changes to it. Getting into the shoes of the author helps edit the story better and adds a personal touch. Contact her via email to request a free sample edit. A team of professional publishers, writers, marketers, editors and designers come together to offer the best of self-publishing. If you are not looking for a publisher but need only services such as editing, then Quignog can offer you that too. Mukund Sanghi founded Quignog as a company providing content in digital, visual and print format across genres and mediums. Based in Delhi, they can nudge your book from something written by an amateur to something that reads like the next bestseller. Their website is easy to navigate and you can even calculate your editing costs once you enter your word count! That may sound mechanical since you haven’t even spoken to a team member or editor to discuss your project. But don’t worry; they can give you a free edit so you get an idea of their skills and expertise. Use this link to fill the online contact form or get a quotation about your editing services. This academic editing service company has ensured millions of authors get printed and published in journals and books. Editage was formed in 2002 to support academic authors and translators by editing their research material and papers. Over the years they have expanded services on offer to include translation, proofreading and editing fiction and non-fiction. They have several expert editors and writers on their team to assist you in completing your book. You get the chance to choose the editor you want to work with. Choose between their different packages depending on the budget or your needs. You can also request a free sample edit of up to 1700 words. Between 2000 editors and 6000 books edited so far, we doubt you will be unhappy with the services provided by Editage. Use this link to learn prices or contact details for the company. A company solely dedicated to editing and writing, they are based in Kyoto and Kolkata. With a team of scientists, publishing professionals, editors, writers, business executives and researchers, they can help edit any genre of your book in fiction and non-fiction. They offer 3 types of editing for authors and writers in need. Their pricing is competitive and they can connect you to the expert in your field who can guide you in proofreading, editing and reviewing your book. Email them to discuss project details and other information. Do you know any other book editors in India? Please tell us about them in the comments box underneath.